Over the years educational costs have risen tremendously. This has put an additional financial burden on the college students and their parents who are finding it difficult to meet the high costs of education. Not only students have to shell out increased fees to their college or educational institution, but they also have to spend huge sum of money on purchasing their college textbooks. To ease some of the financial burden of the college going students, some prominent bookstores are offering them textbooks on rent. So they can study from them without purchasing them. 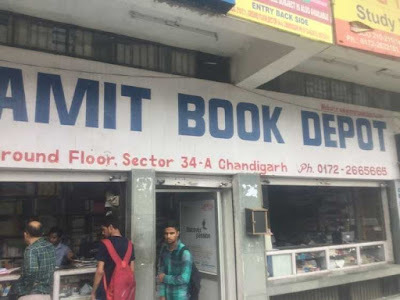 Amit Book Depot is such a leading bookstore located in Sector 34A, Chandigarh which is offering college students the option to avail its books on rent. It is providing such textbooks for students pursuing various graduation and post graduation courses including professional ones like B.A., B. Sc., B.Com, B.B.A., B.C. A., M.C.A., M.Com, M.Sc., B. Tech and M. Tech. Apart from college textbooks, this bookstore is also offering on rent some competitive books for job aspirants preparing for SSC, Bank P.O., Clerical, I.A.S. and U.P.S.C. exams with an aim to get a job in these fields. Students keen to avail such textbooks and competitive books on rent from this bookstore, have to pay a charge on either semester or annual basis. Its rent charges fall in the range of 20% to 35% which vary from product to product and the version of book one is seeking. To get them on rent, interested students and job aspirants will have to visit the bookstore. By availing their textbooks on rent from the said bookstore, students can save a significant portion of their money which would have been otherwise spent on purchasing these books. They can use this saved money towards fulfilling other more important education related needs of theirs. This certainly would bring some relief to their harried parents who have to work extra hard to arranging finances for satisfying educational needs of their wards. By taking these books on rent, students can better focus on their study. They can use them as a reference for making their notes and for preparing for their exams. These would help them in getting good grades in their exams which in turn would let them achieve their academic goals. These books would thus act as stepping stones for students wishing to have a great professional career. If you are a student who wants to do graduation or post graduation in a particular field of education, you should seriously consider taking your textbooks on rent from this prominent bookstore as this would help in reducing your educational costs as well as save you from the stress of arranging extra money for funding your education. Also you can better focus on your study as you will be having quality textbooks with you and thus you can work towards realizing your educational and professional goals. If you are considering taking textbooks or competitive books exam on rent, look nowhere else but come to Amit Book Depot as here you would be getting the best quality books on rent at an affordable price. In this way, this prominent bookstore will help you in realizing your academic and professional goals.